If there were ever any doubt over whether mobile phones with cameras would replace current low-end consumer digital cameras, then the announcement in Japan by NEC of a new high-resolution image processor makes things very clear. 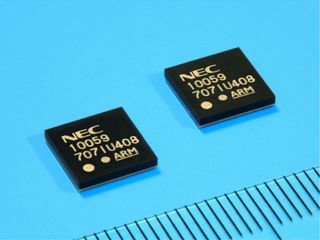 The company's newest chip package features an image-processing LSI chip designed specifically to work with CMOS sensors of up to 8 megapixels. Crucially, it's the first such chipset to be able to handle the large amounts of data such sensors generate. Should any phone maker choose to put an 8-megapixel sensor in a handset, the LSI will manage the data flow required to process the image and display it onscreen. It can link to up to 64MB of memory, which is essential for manipulating large amounts of image data. On top of the raw numbers, the new technology also includes correction circuits to ensure life-like colour reproduction and to counteract camera shake. Although it's inevitable we'll see 8-megapixel cameraphones become commonplace before long, the end result still hinges on them including lenses that can make the most of the imaging power. Low-end point-and-shoot cameras are already at risk. But decent cameras with large lenses remain the only option for quality photos.